Skipper rescued after sunbathing on apartment ledge in Hoboken. 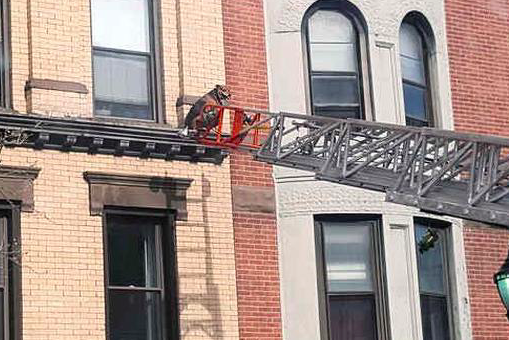 Firefighters in Hoboken, New Jersey saved a lucky dog from the precipice of death Thursday morning after the pet wandered on to the ledge of its owner's apartment building. According to Hoboken city officials, the canine daredevil, Skipper, was spotted around 9:30 a.m. catching rays on a ledge several stories above the complex on the 1200 block of Washington Street, NJ.com reports. A Hoboken Fire Department spokesman said Skipper apparently busted through a screen window and took a seat. Fire firefighters extended their ladder and found the dog in good spirits, fully willing to resume the normal activities of his dog life. No firefighters were injured in the incident and the city even had the sense of humor to point out that handles cases like this routinely and indiscriminately.